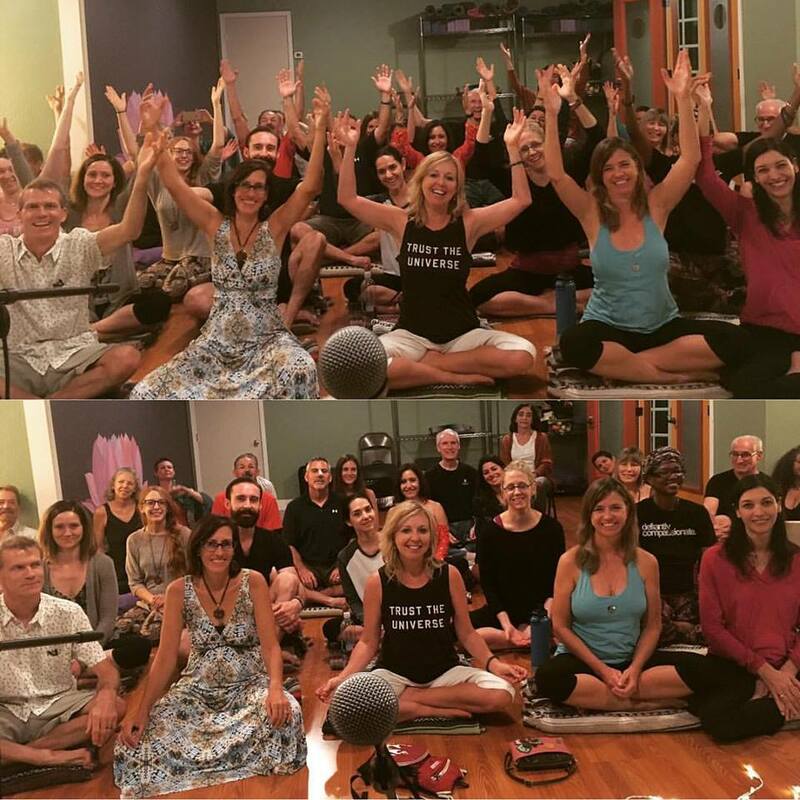 ​What is Kirtan and Who Is Doing It? “Here is what I notice about kirtan and process thought: What comes to mind is, like process thought, kirtan affirms the individual and the community. What I mean is that when we do kirtan in a group it is still a solitary process, we are experiencing our own relationship with the divine…we are feeling God in our heart and we are opening our hearts in response to God. When we do that in a group we are also having a collective experience. Our voice join with the voices of others and becomes one with them, even while retaining its uniqueness. In this way kirtan affirms the individual and the whole. I think about why and how singing the mantras can transform the world. I say this because there can seem to be a focus the individual benefits of this spiritual practice without an emphasis on the rest of the world or, especially, on activism. I have had to think about this because I’ve wanted to reconcile my kirtan practice with my work in the world, which lately includes a very real urgency for what I believe is a need for radical revolutionary change. ​It was an accident. Really. It happened without me realizing just what was going on. I mean I didn’t set out to fall in love with the Monkey God. It started innocently enough. I began chanting with Krishna Das, in person whenever possible, and daily with his CDs. He is featured on this website: see Hare Krishna and Amazing Grace. I moved on to others – now I chant with many different kirtan wallas, but Jai Uttal and Krishna Das remain very dear to me. Kirtan opened my heart in an extraordinary way. Singing the Divine names brought me not only to ecstasy – it brought me beyond ecstasy. It still does…sometimes, but I’m not attached to that…mostly. Chanting the Divine names brings me into the Oneness where the Name and I are One. It connects me to the inner guru. At times I’m not singing the chant, the chant is singing me. When I first started doing kirtan I sang a lot with KD’s album, “Live On Earth.” It was there I first heard the Hanuman Puja, a beautiful prayer to Hanuman, and also the Hanuman Chalisa – forty verses to Lord Hanuman written by 16th century Indian saint, Tulsi Das.I was drawn to learn the Hanuman Puja and sing the Hanuman Chalisa. I sang it daily. Reading the words, memorizing what I could, I sang at home. I sang at work. I sang in the car. I sang it in the veterinarian’s office waiting for my kitty to be seen. I sang it to myself while I was waiting at the doctor's office. I sang it while my car was going through the car wash. The Chalisa recounts Hanuman’s life and exploits, originally told in the Indian epic the Rayamana. Within Hanuman’s story we find profound spiritual lessons and adventures for the soul. Hanuman was born to Anjana, a Vanara, or monkey, through the intervention of Vayu, the wind God who brought the seed of Lord Shiva to Anjana in order to fulfill the need for Shiva to incarnate and join Rama, an avatar of Vishnu, in Rama’s quest to rid the world of evil that had come in the form of a ten-headed demon, Ravana. What a beginning! And from the beginning sweet little Hanuman was mischievous. His mother told him that all red fruits would be his to eat, so one day, seeing the sun he leapt up to grab it and chased the sun only to be struck down by a thunderbolt from Indra, the Deva of the heavens, who was annoyed that Hanuman stopped an eclipse in progress. That is how Hanuman’s chin became red and he got the name, Hanuman, which means the one with the broken cheek. Vayu was so upset he took Hanuman and withdrew all the air from the world. The gods beseeched Vayu to release the air, in return they granted many boons to little Hanuman. He was given extraordinary powers: immortality, the ability to shape shift, great strength, the power to become very tiny or very large, to leap and reach far, and many more – in other words, Hanuman became a powerful being. Hanuman was still a somewhat naughty child. He bothered the Rishis while they meditated by pulling their beards and disturbing them. In response to this, Hanuman was given a mild curse – he would not know his powers unless he was reminded.Hanuman is also known for being very learned, having studied with Surya, the sun god, by traveling facing backwards and coming to all knowledge. Hanuman met Ram and his brother, Lakshmana when they were wandering through the forest in search of Sita, Ram’s wife, who had been kidnapped by the demon, Ravanna. Hanuman joined the search along with a throng of monkeys and bears. Hanuman recognizes Ram as his own beloved and bows before him - vowing to serve Ram with selfless devotion. Some say it is Shiva recognizing Vishu and recalling his desire to assist Vishnu in ridding the world of evil. At this point Hanuman’s most well-known and exciting exploits begin. While on their search, Lakshmana was struck ill only to be cured by a certain herb. Hanuman jumps to a mountain in search of the herb. With no time to waste, Hanuman carries the mountain with the saving herb to Lakshamana. He leads the search for Sita, finding her in Lanka, where she has been held captive. When faced with crossing the vast ocean to get to Lanka, the other monkeys assure Hanuman that he can leap over the ocean, and so, reminded of his powers, he does just that. Hanuman makes himself tiny to sneak into Lanka. He finds Sita desolate and despairing. He gives her Ram’s ring to show her he comes in her husband’s name and assures her Ram will rescue her. Hanuman fights Ravana’s demons, making himself huge to break the ropes used to tie him up to immolate him, with his tail on fire burns down Lanka and douses his tail in the ocean. Hanuman leaves Sita to bring Ram to her, insuring that Ram himself rescues his beloved wife, and Hanuman takes none of the glory. Back at the court, Sita presents Hanuman with a precious necklace. Hanuman immediately begins biting apart the gems, much to the horror of those watching. They say, “Silly monkey, what are you doing?” Hanuman replies that he is looking for Ram for Ram should be inside all things. The others ask, “So, is Ram inside of you?” In that moment, Hanuman rips open his chest and there reside Ram and Sita. In gratitude for Hanuman’s love and service Ram embraced Hanuman and offered himanything he wished. Hanuman said he wanted to remain in the world and be present wherever Ram's name was spoken. And so it is that Hanuman remains available to all of us This is the message of Hanuman Chalisa. We recount Hanuman's story and his many attributes and he is as near as the breath. And so it was that I sang the Chalice day and night. Enter Hanuman. And I mean that literally. Into my wide-openheart walked Hanuman and there he lives. Just like Ram andSi ta live in his heart. The fact is I want to be like Hanuman – I desire to be the ultimate devotee so that everywhere inside of me and outside of me is God’s name written all over me. If I were to rip open my chest, I want Hanuman to be sitting there, with His chest ripped open and Ram and Sita sitting inside of Him. Hanuman is the ultimate devotee, showing utter devotion to God, to love, to the One. Hanuman is the model of humility, responding to the lure ofego-less, selfless service, and needing to be reminded of his power. He doesn’t strut around displaying his power. He acts in love for love as love. Some people have asked me if I “believe” in Hanuman. That’s like asking me if I “believe” in love. 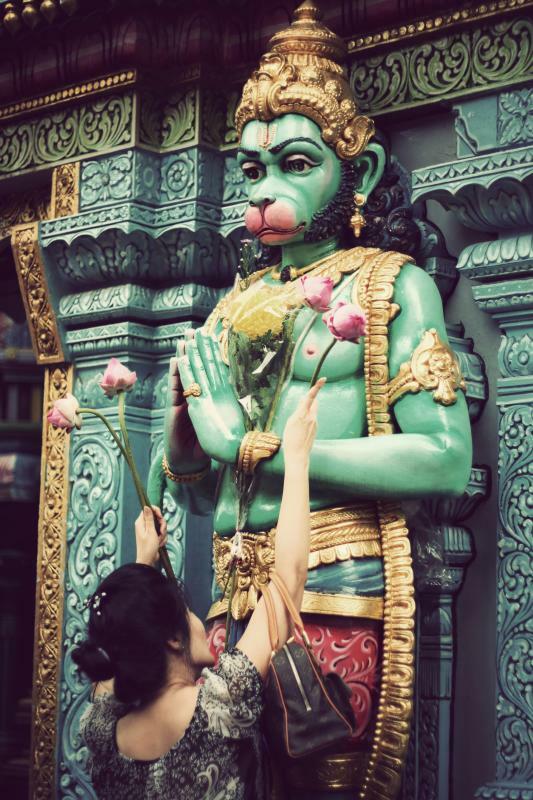 We can understand Hanuman (and the other gods and stories) as archetypal, and that understanding has been helpful for me over the years as my relationship with Hanuman has developed – it gave me handholds in what was becoming a mysterious, and sometimes surprising, experience of utter love and amazing boons. Finally, I just let go of the handholds. I let go of explanations. I rest in Oneness. I merge with Hanuman and find within Him and the stories the timeless truths and boundless love that guide this mystic’s path. Chanting the Hanuman Chalisa opens my heart, reminds me when my soul is captured by fear or insecurity or uncertainty that there are forces at work to bring me back to who and whose I am through the power of spiritual practice. So, how did this happen? Could it be that copy of Ram Dass’ groundbreaking book, Be Here Now, that I first saw when I was sixteen years old, which had a picture of Hanuman standing with his chest ripped open? The book tells Ram Dass’ story of transformation from Richard Albert to Ram Dass and his meeting with his guru, Neem Karoli Baba (also the guru of Krishna Das, Jai Uttal, and Sharon Salzberg) himself said to be an incarnation of Hanuman. Maybe my long association with Ram Dass, Krishna Das, Jai Uttal, and by extension Neem Karoli Baba, lived in me, and prepared me, years later, to enter into a relationship as a devotee with Hanuman. If, indeed, as process thought tells us, our past informs our becoming, then that influence has lived in me and came to fruition just when I was ripe for the fullness. I respond to the lure of Hanuman by remembering that the Son of the Wind is as close as the breath and by serving the world with my heart wide open. Live in my heart, King of Gods, together with Ram, Lakshman, and Sita. Let's say that the world is a community of communities of communities. And let's say that the inhabitants of the various communities include people but also plants and animals, hills and rivers, birds and trees Let's add that, today, too many of these communities are riven with violence, inequality, selfishness, cruelty, and injustice, especially among the humans. Assume that the better hope of the world -- maybe even the only hope -- is for communities to emerge which are creative, compassionate, equitable, participatory, respectful of diversity, ecologically wise, and spiritually satisfying, with no one left behind. Let's call them sustainable communities, using the word sustainable to name the fact that they can be sustained into the indefinite future, given the limits of the earth to absorb pollution and supply resources, but also to name the fact that they offer sustenance -- spiritual and material -- to human hearts and minds. Do you think that singing with people can help the world grow into these kinds of communities. Let's be honest. Singing alone cannot do it. We need local manufacturing, renewable agriculture, green architecture, economics for community, wise urban planning, and wisdom-based education. We need cultural traditions that give people a sense of roots and wings: that is, a sense of being grounded in safety and familiar customs, yet open to new possibilities. We need corporations that seek the common good of the world and not simply the parochial good of the company. We need forms of governance that are democratic, open, and transparent. We probably need a wholesale critique of corporate capitalism. There is so much to be transformed. But amid all this, do you think singing together can help? After all, don't we need to become the kinds of people, with the qualities of heart, that will enable us to build and help sustain the sustainable communities just described? How can we become these kinds of people unless we have spiritual practices that help nourish a sense of community bonds and world loyalty. Do you think singing with people can help? Kitzie Stern does and I do, too. She is the founder of New World Kirtan, whose mission is "to transform the world through singing kirtan." The tagline for New World Kirtan is "calming chants for a crazy world." The tagline is as honest as they come. We do indeed live in a crazy world. Of course there's good crazy and bad crazy: compassionate crazy and violent crazy. It's the bad crazy that troubles us. We need a transformation from bad crazy to good crazy. Maybe singing together can help. At least the idea of singing together as a spiritual practice makes sense to me, given the influenced that process theology plays in my life. The philosophical inspiration for process theology, Alfred North Whitehead. speaks of God as the harmony of harmonies: that is, a womb-like yet unbounded whole within whose life the entire universe lives and moves and has its being. This whole -- this Life in whom all lives unfold -- is filled with wisdom and compassion, never forcing but always beckoning us, from within our own hearts, to become the better selves we'd like to be: wise, creative, compassionate, and free. Whole persons in a whole world: that's what God seeks for us. That's God's prayer for us. Do you think that singing together can be a way of responding to God's prayer? Sometimes, when I hear a really good harmony, it sends chills up my spine. There is something immensely beautiful and hopeful about people singing together. The harmony resonates with a hope carried deep within my own heart. I don't know where this hope comes from, but it doesn't feel invented. It is more like a hope I discover than I create. It's God's prayer. And when I myself can join in the singing, adding my own small voice to the greater whole, I feel that maybe even I can help bring about that hope. I know my voice is not that melodic. I really don't mind if my voice is drowned out by the others. But somehow my voice plays a role, too. God needs me. I know that some people speak of God within each person and some people speak of God as beyond all people. But in singing with others I can't help but think that God is also between all people, especially when they are together in ways that are compassionate and beautiful. God is in relationships. You might say that, in process theology, God is the Singing within the singing. The Kirtan within the kirtan. God is love. The word "God" is not what is most important. God has many faces and names, only one of which is "God." We must find the faces and names that are closest to our own hearts. The fullness of divine love can never be reduced to the specificity of a single name. Try Tara. Try Kuan Yin. Try Ishtar. Try Starwoman. Choose the name most conducive to kindness and community. Critics say that all of this is irresponsible New Age-ism. They will say that we are taking names out of context and appropriating them as if they were mere objects of consumerism. Surely there is truth in the critiques, too. If we borrow names from others, let's be respectful of traditions from which we borrow. Let's remember that there are limits to a de-territorialization and re-territorialization of spiritual practices. Let's be self-critical. Let's have the courage and integrity to avoid names and faces when others are offended. Let's have the courage to be silent when our sounds get in the way. Let's remember that the most poignant kirtans are in the cries of the bewildered, the forsaken, the forgotten, the voiceless. When we sing let's sing with them and for them, and remember that no moment of ecstasy is worth a single teardrop of the a child burning in a holocaust oven. But somehow we need to find ways of helping the world become transformed into something spacious and free for all. Something respectful and beautiful. Something worthy of the hope planted in our breast, moment by moment, by the deep Kirtan. Do you think singing can help? It can help and it is best if we find a voice that is true to our souls. The voice does not need to be Hindu or Sikh, Buddhist or Taoist. It needs to be true to the soul and open to the world, inviting a sense of world loyalty. Process theology emphasizes that the world's religions can be vessels of the spirit of the divine Kirtan and also that the Kirtan is more than all the religions. But the good news is that the Kirtan seeks embodiment in different languages, different traditions. It finds its home in the soil of the soul and grows wings. ​Healthy Hybridity or Spiritual Stripmining? Is the worldwide Kirtan movement an example of healthy hybridity or spiritual stripmining? Or both? I leave that for other scholars to determine, and I am sure it depends on context and circumstance. But at the very least it is an example of cultural globalization and hybridity. Cultural Globalization is the process amid which (1) ideas, images, and practices originating in one land or community are abstracted or de-territorialized from their local contexts, (2) such that they circulate within and across many other lands and cultures by means of migrations, the internet, films, books, television, radio, and education, and are then (3) replanted in other lands, cultures, and contexts often in quite surprising ways, where they are combined with cultural traditions with which they were previously dissociated. When the ideas are combined in fresh ways in other settings, a kind of hybridity becomes inescapable. The hybridity can be conflicted or harmonious, constructive or destructive, unhealthy or healthy. But the blending is unavoidable. Sometimes hybridity can be psychologically or socially damaging. It is unhealthy (1) when it robs local traditions from their last vestiges of self-identity; (2) when it is expressed as a false and shallow cosmopolitanism which is aloof from the poor and powerless of our world, as occurs when urbane “world citizens” with privilege and class celebrate their own width of perspective by staying in five-star hotels while others live in poverty; and (3) when it results in people becoming too wide and porous in their own perspectives, but somehow losing a sense of personal moorings, as seen when people are open-minded but lack any kind of personal center for their lives. Additionally and importantly, the very word “hybridity” is misleading if it suggests the impure product of two formerly pure ingredients. All cultural traditions have emerged as combinations of insights and practices which were once separated but then combined. This includes Hindu and Sikh Kirtan. There is no "pure" tradition. What we might call "pure" traditions are traditions which, as they began, were hybrid, and which then consolidated into trajectories which people called "authentic." Still it is the case that the West brings with it a long tradition of disrespectful and narcissistic hybridizing, in the context of which other traditions have been subjected to cultural stripmining. Healthy hybridity seeks to avoid this, It is respectful of original sources, humbled by their indigenous beauty, and mindful of the dangers of exploitation. It seeks to avoid a consumerist mindset that approaches all things as objects of consumption, as candidates for appropriation in a spirit of self-centered narcissism. Participants in the worldwide Kirtan community -- including followers of the New World Kirtan podcasts -- are sensitive to these issues. 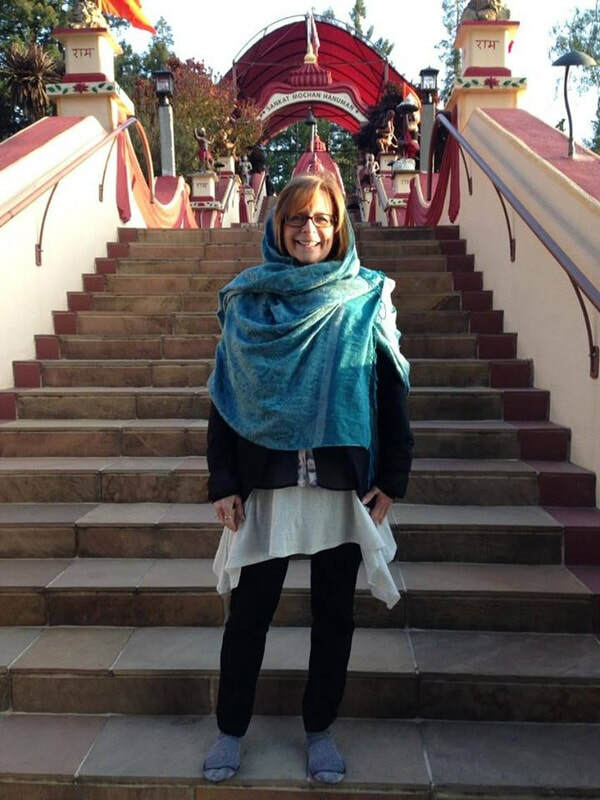 Kitzie Stern's hope is that the New World Kirtan community can foster healthy hybridity. This is the hope of process theology, too. It sees the Life in whom all lives unfold -- God -- as a lure toward healthy hybridity. The One with many faces is a lure toward a creative synthesis of diverse traditions amid which the uniqueness of the traditions is honored. 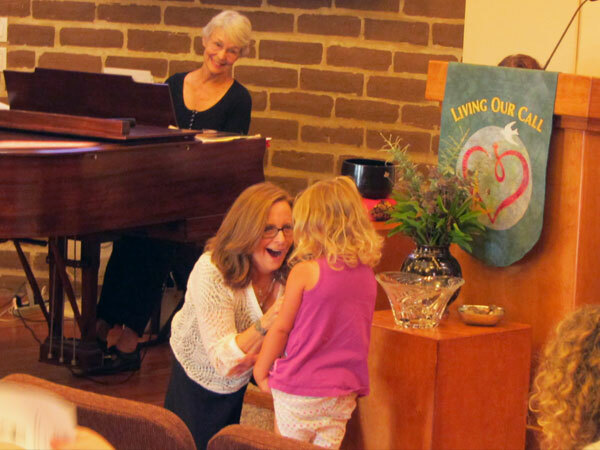 And sometimes, oftentimes, her invitation is for us to sing. Process Theology is a way of thinking and interacting with the world influenced by the "ecological philosophy" of the late philosopher and mathematician Alfred North Whitehead. He emphasized that everything is iinterrelated, that everything is becoming, that everything is alive in its way, and that the universe is enfolded in a divine Life in whom all life unfolds. People influenced by Whitehead live in all parts of the world: North America, South America, Africa, South Asia, East Asia, and Europe. Some are Jewish, some Christian, some Muslim, some Buddhist, some Hindu, some Taoist, some Confucian. Some are spiritually interested but not spiritually affiliated. The articles in this website are explorations on a wide variety of topics in the spirit of process theology. Process theology proposes that the Life in whom all lives unfold is within each living being as a lure toward personal happiness and social well-being, toward peace of mind and social justice, toward inner joy and beloved community. The Life - God -- comes to us in many ways and with help from many imaginal presences, each with unique vitality. One of the beautiful faces can be Tara. Process Theology can help you understand and appreciate many different kinds of spiritual experience: ecstatic and contemplative, mystical and ordinary. In an article we speak of Eight Kinds of Mysticism that make good sense from a Whiteheadian point of view. Often these are combined in particular settings. The key emphasis on bhakti fests is on immersion in a sea of divine love through music. It combines interconnectedness, local community, creative energy, and archetypes contained within the mantras, but its primary focus is on divine love. However, and wisely, they do not want to throw out the baby with the bathwater. There is a deep need in western and global society for forms of ecstasy that enable people to be released, at least momentarily, from the shackles of an ego-bound mind into a new and more spacious arena where love, not hatred, is the dominant emotion. Process theology recognizes that this love can indeed by divine love as experience in human time. Often it is experienced in music, including when people sing together. Process Theology also recognizes that there is a need in the minds and hearts of many westerners, originally steeped in Abrahamic traditions, to move beyond a fear-based approach to God which envisions God only as a dominant authority or, at best, a nurturing parent. Hinduism offers images of God as lover, friend, and child which nourish the otherwise stifled imagination, parallels to which can be found in neglected traditions of western religion as well. In Christianity, for example, the poetry of John of the Cross and Teresa of Avila finds God, not as the divine parent but as the divine lover. And in Islam the poetry of Rumi does the same. Perhaps the bhakti-influenced, emerging kirtan tradition can help those of us who are Jewish, Christian, and Muslim remember that, after all, the One we seek is seeking us, too, perpetually beckoning us to make peace in a crazy world.